All you have to do is take your pants and, making sure to cut through both layers at once, cut out 4 rectangles measuring 12.5"(w) x 11.5"(l). You will end up with 8 panels. This fits my 2 year old really nicely but the 'pattern' is easily adjustable. Just change the width/length/amount of panels as needed. 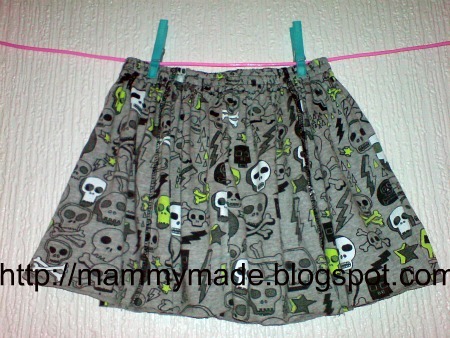 My measurements make a slightly above knee length, very gathered skirt. If you are using anything other than knit or fleece or if you prefer a properly finished hem you will need to add an inch onto the bottom. I serged mine so I cut it to the length I wanted it to end up. To sew it all up, take two of your panels, lay them right sides together and pin up one of the lengths. Sew using a straight stitch 1/4" from the edge. Follow with a zigzag stitch in your seam allowance. Or serge if you prefer. Add all of your panels in the same way until you have a long rectangle all nicely stitched. Take the two end panels and lay them right sides together. Pin and stitch as above. You should now have a tube all stitched up. Finish the bottom of the tube as you like. Either hem it, serge it or leave it unfinished if your material doesn't fray. To make my waistband I cheated a little bit. Measure how big your elastic is, multiply that by 2, then add 1/2" on that for wiggle room. Measure that far down from the top of the waistband and draw a line all the way around the top of your tube with a water soluble pen. My measurement was 2". Simply fold the top down to meet the line all the way around. Pin well. 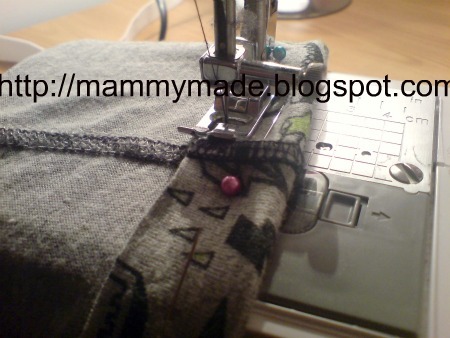 To make your elastic casing, you want to stitch all around where you've pinned, leaving about a 2" gap at the back of your skirt to insert your elastic. I back stitched at the beginning and end of my stitch to make sure it didn't unravel while I was putting my elastic in. Cut some elastic the size of your child's waist. Mine was 18" for a skinny 2year old. Take one end of it and attach a safety pin. Start pushing the pin and elastic through your casing. You will probably want to safety pin the other end to your skirt so you don't lose it. When you have your elastic all pushed through, take both ends, overlap them about 1/2" and sew a zigzag stitch to secure. I went back and forth about 5 times. Sew up the 2" you left open. You could leave it there if you like but I like my waistband to look a bit more finished. Adjust the gathers to where you like them, you'll probably find that even when the elastic is pulled tight there are quite a few gathers. That's ok, it's just because the skirt width is much longer than the elastic. Get your gathers as neat as you can. Starting from the back, stitch two long lines all the way around the waistband. I did my first line 1/4" away from the top of the waistband and the second line centred in between the first line and the line I stitched for the elastic casing. Fabulous little skirt!!! Adding the extra rows of stitching to the elastic stops it from curling... great idea. A fantastic refashion and a great tutorial!! !